When it comes to transition and change in our lives especially a major role or direction change timing is everything. One of the major principles I’ve learned as a leader and Pastor and for that matter a follower of Christ, is that every time God leads us, or gives us a dream, or reveals a change to us, it is hardly ever immediate. Example: God gave Joseph a dream at 17 and it didn’t come to fruition until he was 35. Foolishly, many times we get a sense of Gods leading and we run out and tell everyone about it, and start trying to make it happen NOW! Its not hard to understand why. We are excited. However, what we must realize is that when God shares something with us, especially a change or transition in our purpose or destiny, it is a starting point. There is always, ALWAYS, a process before we obtain a promise. God will reveal it to us, to start the journey in us. With God, internal change always precedes external change. When I was a lot younger I had a habit of getting carried away when I would get a revelation of something God wanted to do in my life, and I would share it and start working on it. Its funny that in the last few years God has brought to completion some of those things I heard when I was in my 20’s. Some of those things took a decade to happen. I had to change, for the change to manifest itself externally. Having gone through some things I now realize that timing is very important, and when we get out of the timing of God it creates major problems not only for us but for those around us. One example that still effects the world today. Abraham and Sarah trying to hurry the promise of God by using Hagar as a facilitator of the promise. Now look at the antagonism in the world because of that mistimed move. I’m not so bold as to say that a mistimed move from us would be so important as to effect the entire world, however it will impact those people in your world. So timing is very important. The transition we just went through took time, and was done right and has resulted in some great things. We were at our previous assignment 15 years. A long time to be in one place. I love longevity, and God loves longevity. Transitions and whole life changes should not be the norm or happening every couple of years in your life. There may be times that God will use you in a place for a small season but that shouldn’t be normal. That is a man made idea or thought. True impact comes over time. It takes time. Not a popular opinion in our world, but time is important. God spoke to us 13 years in to our last assignment to prepare us for change from the role we were in to move back in to the senior pastorate. So our process unfolded over a 2 year period. There were a lot of opportunities to be impatient, to give up, to be conflicted, and we had our moments, but we held on and made a good, solid, timely transition that was a benefit and blessing to everyone concerned. How do we make sure we move in Gods time? 1. Consider the people you are going to impact by your move. It is not God’s will for people to be hurt and disconnected through your change or transition. 2. Surround yourself with prayerful, trusted, confidants. 3. Be committed to being sent, don’t just go. self centered in all this. keep your eye on the big picture, not just your picture. and thought you have about this. 5. When you start feeling out of place and you will, be patient. God is control. 6. When its time to communicate, do it. 7. Remember there is a timing on both ends of the spectrum that is happening simultaneously. So I hope this helps. Be patient. Don’t underestimate the importance in moving in Gods timing, and if you are going through it right now, and it seems like its taking forever, ask God what you need to learn, and what needs to develop in you in preparation for this new step in your life. It will be here before you know it. Transition is an interesting thing, and happens in different ways for people. For those who are content doing what they do, or living in the season of life they are in, it can be hard to get them to realize its time for a change. I was such a person. I had been in the same church, on the same team for 15 years. About 13 years in I started getting a prompting in my heart when I would pray or talk about the future, that there was a change coming. I was around 42 when this was happening, so I just ignored it at first. I thought maybe I was just getting restless and having a mid life crisis of sorts. So I tabled it for a while. It just wouldn’t go away. I had always said, I will not leave unless God tells me its time. I was content in the role I was playing. I was able to do many things God had placed in my heart, there was no natural reason to go. So in my attempts to just ignore it, God had to get my attention by changing my circumstances. 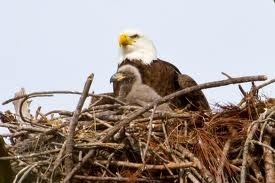 The only way I know how to describe it is how an adult eagle gets a baby eagle to leave the nest. I have read that the adult will start taking the fluff out of the nest so all thats left is the sticks which makes the nest very uncomfortable. I began to feel completely out of place. There were times I felt like a guest. like I was the odd man out. I was the right hand man to the Leader of our organization yet I felt out of the loop and completely disconnected at times. I looked around for someone to blame. Was it my leaders fault? Was it my peers, was it those who worked for me? Or, was it my fault? What was going on? I arrived at the place of total frustration, to the point of tears and hopelessness, thinking something was wrong with me. The desired effect God wanted was accomplished. It caused me to begin to entertain the idea that there was change coming. When you are a deeply loyal person, heavily committed to your leaders, and to your current situation, something has to be done to get you off high center, and get you moving. I had strange feelings when I begin to entertain the idea of change. I felt like a was betraying my leader. I felt like I was alone. I began to see things I didn’t like about people I worked with. Things that hadn’t bothered me before, were now unbearable. The nest was becoming increasingly prickly. Less and less comfortable all the time. Until finally I realized its time. I was unsure of how to get out of the nest. I didn’t know where I would land, or if there was even a place to land. I assumed my leader would handle things well, but you never know how people will respond, (they handled it with the utmost grace and partnership) but I finally understood, its time to fly. There is so much to talk about in this process of transition, and we will be over the next few blogs, but let me finish this blog by saying most people in todays culture don’t handle transition well. We don’t know how to handle ourselves when things start changing and we realize that everything you’ve experienced to this point was merely a sub plot in your over all story. The sad part is, many don’t make the transition into the next part of the story well, which negatively effects the rest of their story. So, if you are person going through transition right now, going through this phase where things are getting uncomfortable? You are not sure how to proceed but you know something’s got to give, here are some things not to do. 1. Don’t let your discomfort in the nest make everyone else uncomfortable. frustration and make their life hard. 2. Don’t let your new change in perspective ruin the perspective you have always had. know you won’t be in it anymore. let that ruin your relationships with the family. bad, by handling it badly. 3. Don’t let your own feelings of insecurity about the future become the central them of your story. focus on your role in the nest. good as your commitment to the nest. 4. Don’t Jump out of the nest, let your eagle release you. >Don’t just go, be sent. mature enough to leave yet. 5. When you finally transition from where you were to where you are going, it is something you ultimately have to do alone. As we continue these thoughts on transition. I want to encourage you to embrace change as God brings it into your life, but transition is a God thing, so its futile to just do it. Why do you transition from one role to the another, from one season to another, one level to another. Only one reason. Because God said to.